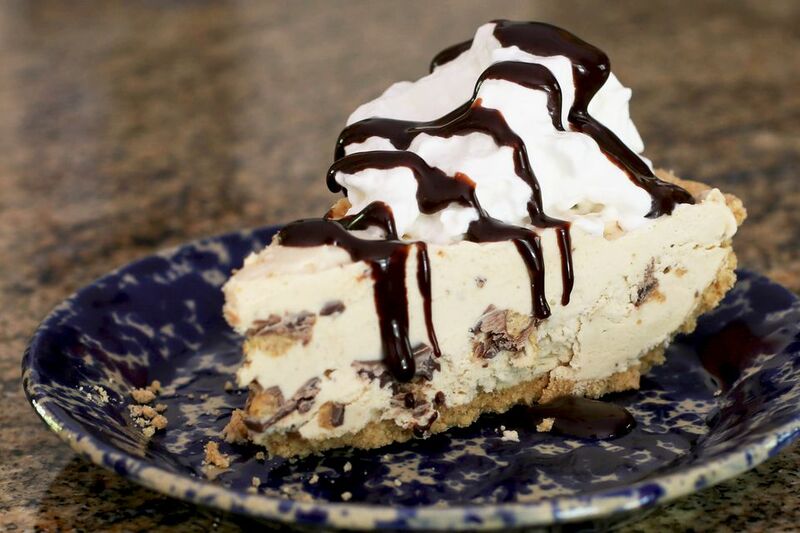 This awesome frozen peanut butter cup pie is the perfect dessert or weekend treat for a hot summer day. The classic graham cracker pie shell and simple cream cheese and peanut butter filling take no more than 10 to 15 minutes to prepare; just mix, freeze, and enjoy. To make this even easier, use a store-bought deep-dish graham cracker pie shell. An oreo or chocolate cookie crust would be an excellent choice as well. Freeze the peanut butter cups to make chopping them much easier. In a medium bowl, combine the crushed graham crackers with melted butter and 1/4 cup of brown sugar or granulated sugar. Mix well and press firmly over the bottom and up the sides of a 9-inch deep-dish pie plate. Cover and refrigerate the crust to chill for at least 1 hour. In a large bowl, combine the softened cream cheese, sweetened condensed milk, peanut butter, and confectioners' sugar. Beat on medium speed of an electric mixer until smooth and well blended. Fold in the whipped topping until blended, and then fold in the chopped peanut butter cups. Fill the chilled graham cracker pie shell with the peanut butter mixture. Cover the pie tightly and freeze for at least 2 hours, or until the filling is firm. Set the frozen pie out at room temperature for a few minutes before slicing. Serve with a dollop of whipped cream or whipped topping and drizzle with warm chocolate sauce. Sprinkle with reserved chopped peanut butter cups, if desired. If possible, freeze the pie for several hours or overnight before serving. Give the pie about 10 minutes at room temperature to soften slightly before slicing. If desired, bake the crust in a preheated 400 F (200 C/Gas 6) oven for 10 minutes. Cool completely and chill slightly before filling. Make this peanut butter sauce to drizzle over the pie along with the chocolate syrup.